Clear Vinyl Presentation Folders are another unique way to protect and promote! Built in 5 inch pockets on both sides of the folder. The clear vinyl makes viewing the documents inside easy and visually pleasing. 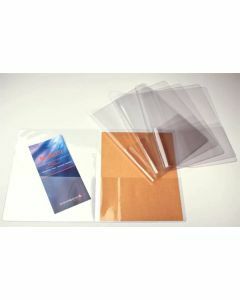 Clear Vinyl Presentation Folders are another unique way to protect and promote! Your samples or brochures will stand out while being protecting them while you store them and when you send or hand them out. Made with a center crease and built in 5 inch pockets on both sides of the folder. The clear vinyl makes viewing the documents inside easy and visually pleasing.